When Casey Stengel said, "You could look it up," he might have been talking directly to SABR members. Casey's famous challenge is a quick definition of research, and research is what many SABR members like to do. It is, in fact, the lifeblood of the organization. Conceiving and completing a first-rate research project is not always easy, but it is almost always worth the effort. Research can be educational, and it can be fun, and anyone can try it. Best of all, when research gets difficult, as it often does, there's lots of help. Research assistance in the Age of Information is widely accessible. You don't have to quit your day job or live within fly-ball distance of a major library. You just have to know where to look it up. And to make things better, there are people to help you look it up. And they are ready to help you. You just have to ask. For a comprehensive list of research resources, check out our Research Resources page. Next to the ballpark, many SABR members call the library the place they like best. Local libraries come in many shapes and sizes, but they are all worth a visit. People are sometimes intimidated by libraries, but there is no reason for that. Libraries are established and maintained to serve people, to serve you. No one will make that point more strongly than professional librarians themselves. You should make your local library your first stop as a baseball researcher. But remember, libraries vary. If you live in a large city, your local library is probably part of a library system with a headquarters, neighborhood branches, and substantial resources. The New York Public Library, for example, a private institution (despite its name) with four major research libraries and eighty-five branches throughout Manhattan, the Bronx, and Staten Island, is quite imposing. Its book collection, numbering in the millions of volumes, has been called "the diary of the human race." If you live in a smaller city or town, your local library will certainly be more modest, but it still may be a significant institution with holdings and services appropriate to the size of your community. Resolve to use your local library fully, regardless of its size or budget, and leave no research stone unturned. The staff members there, even if they are not baseball savvy, can get you started. They can show you around the place and introduce you to the sources in their holdings. In addition, thanks to the Internet, they can show you how to open doors to other libraries around the world. Some local libraries will be of more help than others, but all of them can provide basic assistance to SABR researchers. When you look it up, start there. If you live near a university, check to see what its policies are for using its collections. Academic libraries may restrict borrowing privileges to faculty and students, but almost always are open to the public to use materials in the library. (If you are an alum of your local college, ask if you can qualify for a card that way. A few academic libraries have agreements with local residents to allow some access.) Academic libraries focus their collections much differently than public library. Books and journals are bought to support academic research and instruction. But don't let that scare you. You can find some wonderful resources at an academic library. You may have to be prepared to find some on your own as they usually don't have as much reference staff on duty as a public library. However, the librarians at an academic library will be more than happy to help you use their collection as best they can. Remember also that if a library is part of the U.S. Government Printing Office Depository program, the institution is required by law to let you in to access any of those materials, no matter what your status is. This can give you access to a wealth of Congressional documents. Some SABR members may begin their research in a library and then continue their work in an archives. (That's right, "an archives" is correct. The word ends with "s," but it is both singular and plural.) Others might not be exactly sure what the word "archives" means or how an archives differs from a library. So here's a primer. Archives and libraries are cousins, but they are not the same thing. The primary difference is this: Libraries hold materials that, in general, are not unique and are available elsewhere, in other libraries. Archives hold materials that, in general, are unique and are not available elsewhere, at least in their original format. When we speak of library materials, we are talking about books, serials (periodicals), newspapers, and pamphlets. Archival materials, on the other hand, include manuscripts (that is, the papers of individuals or families) and records (that is, the papers of private and public institutions, including government). Obviously, library materials, like the latest edition of Total Baseball or the current issue of The Sporting News, can be found in many places. But archival materials, such as the papers of Branch Rickey, can be found in only one place. Library materials often circulate. That is, patrons can, by following certain procedures, take them home for a period of time. Archival materials never circulate. Patrons must use them only within the confines of the institution that holds them. Sometimes an archives stands alone as a separate entity, perhaps with a small reference library included within. Sometimes an archives is contained within a library. This is especially true at colleges and universities whose libraries often contain special collections or manuscripts departments. And sometimes an archives and a library are co-equal parts of a larger organization, such as a state historical society. The important point for SABR members to understand is that both libraries and archives are places where research can be done. Both have reference staffs eager to help. But whereas almost any library can get a novice baseball researcher started, only a few archives, those that hold baseball-related materials, can do the same. Archives have the raw material that books are made of. By themselves, archival materials may not seem to mean much. But, after they are organized and examined and synthesized, they are extraordinarily powerful resources. Some of the more important archives are listed at the end of this article. But, you can also ask your local library if it has a copy of the Directory of Special Libraries and Information Centers. It is one of the few updated print publications that list archival collections. The Library of Congress used to publish a National Union List of Manuscript Collections. Entries from 1986 on are now part of OCLC WorldCat (see below), but earlier ones have to be tracked down in print volumes. Some small libraries direct patrons walking through the door for the first time to a general information desk or to the circulation desk, but most libraries and archives have a reference desk or a reference department. New researchers should start there. Reference librarians and reference archivists will help you all they can. They are not only trained to do so; they are paid to do so; they want to do so. In fact, the American Library Association and the Society of American Archivists have published guidelines that direct reference personnel to treat patrons courteously and helpfully. If there is one shining exception to the perception of bureaucratic apathy in the United States, it can be found in the reference rooms of America's libraries and archives. They cannot do your research for you. Reference personnel are trained to help you find the sources you need to do your own research. They can tell you what items they have in their collection and direct you to them. They can help you understand the online catalog. They can show you how to use microfilm readers. They can assist you in using online databases and with technical issues with the computers. They can help you contact other libraries and archives. They can suggest research paths that you might not have otherwise considered. But they cannot do line-by-line investigative work for you. They may not have an answer for you right away, but they are always willing to get back to you. This is especially true if you contact the library by phone or email. Librarians usually don't like to spend too much time on the phone at the reference desk because they also have to help people in person. Email inquiries usually work better. In both cases though, don't be surprised if the answer is along the lines of "Come on in and we can look in more detail." But, you could also get a reply full of links for you to use to find more information. They respond better to specific questions than to vague or open-ended questions. Give reference personnel a fighting chance. Ask a precise question that expresses exactly what you are looking for. If, for example, you are interested in the 1947 World Series game in which Cookie Lavagetto broke up Bill Bevens's no-hitter in the ninth inning, do not begin your inquiry by asking a reference librarian, “Do you have any books on baseball?” Ask instead, “Can you show me how to find books that might discuss the 1947 World Series?” or “Can you show me how to look at newspaper accounts of the 1947 World Series?" However, a good librarian will be able to ask you enough questions to force you to be more specific. They should not be expected to answer trivia questions. Reference personnel are professionals dedicated to assisting serious patrons. They generally work in institutions that are understaffed and underbudgeted. So do them a favor. Don't ask questions that reasonable people would consider trivial. If you want to know what number Stan Musial wore, fine. If you want to know what size shoe he wore, take it elsewhere. The days of the paper card catalog have pretty much gone the way of the four-man pitching rotation. Library catalogs are all computerized today. In addition to being easier to maintain and available outside the library, computer catalogs allow keyword searching. Researchers can now search nearly all the parts of a catalog record instead of tracking down items by author or title or subject. But, be careful. You still need to know how to refine your search to make it the most efficient. If you drop the word "baseball" into a library catalog under "keyword" you will get several thousand results, including books for children and materials in languages other than English. Ask the librarian for the best way to formulate a search if you aren't sure. The reference staff can also tell you whether the library catalogs its collection using the Dewey Decimal System (which classifies baseball books in the 796.357 section) or the Library of Congress System (which puts baseball in the GV861 - GV881 sections). Once you know this, you can use catalog call numbers to find specific books. Keep in mind that not every library will use the exact same call number for the same book. When in doubt, check the catalog. Libraries are all connected to some other institution in some way. You can use your local library or even your home computer to locate material of interest to you all over the world. The basic search form for WorldCat does not have a lot of options. But, if you know a particular title or author, you can drop it in and see what the results are. When you locate a particular item, you can enter your local ZIP code to see what the closest institution to you that owns the item. The default looks in your home state first and then branches out to the rest of the United States. Libraries in other countries show up next. The entries in WorldCat should always be verified by checking the catalog of the owning institution. Some libraries are set up so you can go directly from WorldCat to the individual library catalog. Others may require you to track down the catalog on your own. Even if you do see the item listed in the library's catalog and WorldCat, the only way you know for sure if an item is really there is to ask someone at the owning institution to check for you. With public libraries, this isn't too hard. However, academic libraries usually won't have the staff. If you're searching for magazines or newspapers, you will want to make sure the entry says "serial" somewhere inside it. Finding out exactly which issues of a newspaper or magazine are owned by a particular library is always tricky. Individual issues of magazines or microfilm reels can easily go astray or get damaged and those changes will not be reflected in the catalog record, primarily because it is a matter of being it nearly impossible to keep track of so many parts of a library's collection. Worldcat is not just a listing of books and periodicals exclusively. It also has information on the holdings of audio and video materials. Some libraries have added access to indexes they have made of individual periodical articles. (They're called "analytics" by those of us in the business.) Some libraries include information about archival materials as well. If you are doing research that may take you back into that era long before the Internet was widely available (a time some people call the 1980s), there are print resources you may want to consult. All of these used to be standard issue in public libraries, but they may be harder to find now. But ask; the staff at the library may have to get them out of storage for you. Books in Print. 1957-present. New York: R.R. Bowker, 1957-present. This source is now available online only and is only sold to places like libraries and bookstores. The older volumes in print can help you identify previously published items. You may have to ask your local library if they have kept them. Cumulative Book Index. 1928-1999. New York: H.W. Wilson, 1933-present. This annual author-title-subject index of books published in English anywhere in the world ceased publication at the end of 1999. All entries are in a single alphabetical list with each book's author entry being the most complete. Cumulative Book Index is indispensable for finding books no longer in print and consequently not listed in Bowker's (see 1 above). For books prior to 1928, see The United States Catalog, 4th ed. (H.W. Wilson, 1928), a two-volume list of all books in print on January 1, 1928. Book Review Digest. 1905-present. New York: H.W. Wilson, 1905-present. Published monthly and later bound into annual volumes, Book Review Digest offers condensed critical reviews about books in all fields. A subject and title index appears in each annual volume, and a cumulative index is published every five years. Book Review Index. 1965-present. Detroit: Gale Research, 1965-present. Although Book Review Index lacks the summaries of book reviews found in Book Review Digest (see 3 above), it locates reviews in approximately twice as many periodicals. The Readers' Guide to Periodical Literature. 1900-present. New York: H.W. Wilson, 1905-present. Approximately 180 well-known general-interest magazines, including Sport and Sports illustrated, are indexed in the Readers' Guide. For material published before 1900, see Poole's Index to Periodical Literature', reprint, 6 vols. (Peter Smith, 1963). The New York Times Index. 1851-present. New York: New York Times, 1913-present. (Early Indexes reproduced by R.R. Bowker.) A subject index to America's newspaper of record, the Times Index is useful for locating material in other newspapers because it supplies dates the researcher may not know. Biography Index. New York: H.W. Wilson, 1946-present. This index covers biographical articles from about 2,000 popular and scholarly serials as well as book-length biographies ,and chapters in collective biographies. 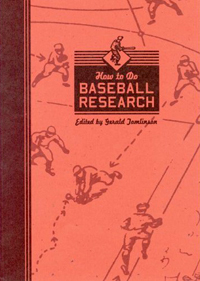 An index to professions and occupations in each volume contains a section on baseball. Dictionary of American Biography. 20 volumes plus 7 supplements. New York: Scribner, 1928-1981. A monumental source of information on Americans no longer living, the DAB contains 17,656 articles in all, about fifty of which deal with people who had some direct connection with baseball. Current Biography. 1940-present. New York: H.W. Wilson, 1940-present. This monthly reference service offers readable, informative profiles of people in the news, including sports figures. Annual bound volumes appear with an index. Many libraries keep the local newspaper and other newspapers, often temporarily in hard copy and perhaps permanently in microform. Hard copy of newspapers has a certain attraction-it is easy on the eyes and gives the reader a "feel" for the period-but microforms (microfilm and microfiche) stand up much better to time and handling. Baseball researchers should be prepared to read microfilm and to learn how to use microfilm readers and reader-printers. How do you find out which newspapers are available in microform? The most common way now is to search WorldCat. It will help if you know the exact title of the newspaper, which tend to change more often than you think. The title will be listed as "Newspaper: Microfilm." Indexes to newspapers are few and far between, but remember that The New York Times Index may be all you need to find material by date in any newspaper. Of course, if you are looking for feature stories not keyed to certain events or dates, then an index is certainly helpful. Most regularly scheduled baseball games will not be listed in the index, so you will just need to go to the date in question. In the past, you could ask newspapers to look up items for you. But, with the cutbacks in the industry, newspaper libraries and librarians are few and far between. The newspaper will almost always refer you to the local library. Most newspapers donate microfilm copies to the local library to help out in this area. One important point: Just as·you·shouldn't be intimidated by a large library, neither should you be scared by microfilm or microfilm readers. They're in the library for you to use, not to frighten you away. There's a first time for everything. Just tell the librarian exactly what newspaper and what dates you want to see, and if necessary, ask for help to get the machine working. Microfilm readers and reader-printers get lots of use. They break down frequently and often develop quirks. Some newer machines operate more as scanners and can make pdf copies, but don't count on finding one everywhere. One of the most revolutionary changes in newspaper research has been the digitization of old newspapers. Several companies are involved. The most prominent one is Proquest (formerly UMI or University Microfilms.) ProQuest has contracts to digitize many large newspapers, such as the New York Times, the Chicago Tribune, the Los Angeles Times, the Washington Post, and the Boston Globe to name a few. ProQuest has made high-quality scans (using the master copies when they made the microfilm of the papers) of newspapers and also created a powerful search engine for them. The databases are not inexpensive though and most public libraries can only afford a subscription for their local paper, not all of them. Depending upon the license the library bought, you may or may not be able to access the database from home. Ask the library staff to find out. Access NewspaperArchive is another database of digitized papers. It covers many more cities than ProQuest subscriptions, but usually does not carry a copy of the larger newspapers. The quality of the scans is as good as ProQuest, but the database does give you the ability to do research in some cities that may be far off the beaten path. Or at least off the path you beat. Other sources for digitized newspapers include the Brooklyn Eagle, available through the Brooklyn Public Library's website. This database covers the newspaper from 1841-1902. The New York Times also provides access to its historical newspaper scans, although you do have to be a paid subscriber for full access. This just scratches the surface of what is available. Digitization projects are underway all over the United States through a combination of public and private resources. Remember, though, that it is still a long way in the future before EVERY newspaper is digitized. It is possible that some newspapers may never be digitized for a variety of reasons. Also, not every digitization project will have access to high-quality masters. There is not enough space here to get into the individual ways to search each of these databases. But ask the library staff for help. They will likely know ways to search that you might not have thought of. Nearly every database will let you search by keyword and also limit by date. But, other databases may be sophisticated enough to let you go directly to a specific page or to look only for certain types of stories. In order for you to use ILL, your library must be a participant. You must belong to the library (have a card) where you submit the ILL request. There may be fees involved, which can vary depending upon the borrowing and lending libraries policies. You may be asked to pay a small fee upon submitting or picking up the request. Don't expect ILL libraries to lend everything. You can get many books and lots of microfilm, but you probably won't get current titles and best sellers, current reference books or rare books. You won't get magazines either, but you may be able to get photocopies of magazine articles. Many libraries may opt to scan articles and email them to you. You don't need to know which library has the item you want. The system will find it for you. If you borrow books through ILL, you can charge them out and take them home. But if you borrow microfilm, you will have to view it at your local library. So make sure your library has a microfilm reader/printer before you place your request. Processing ILL requests often takes several weeks (libraries have their own postal rate to save money, but it takes longer for items to arrive.) But if you need a particular item, the wait will be worth it. The LA84 Foundation Library (the foundation is a legacy of the 1984 Olympic Games), housed in the Paul Ziffren Sports Resource Center in the West Adams neighborhood of Los Angeles, covers virtually all aspects of amateur and professional sport with information on the historical, social, and economic implications of sport as well as materials about athletic techniques, training methods, sports medicine, and coaching. The library is open to the public, but prospective visitors are urged to write or call ahead in order to avoid conflicts with special events. The library's holdings include books, microforms, videos, periodicals, and photos. The strength of the collection is its coverage of the Olympic Games, but it also includes nearly complete runs of The Sporting News and Sports Illustrated, team media guides, World Series programs, the sports section of the Los Angeles Times (in paper!) dating back to the 1930s, and various other rnaterials related to baseball. (SABR's Allan Roth Chapter holds many of its regular meetings here. Recently, the library has engaged in an ambitious digitization project. The title of interest to SABR members is Baseball Magazine. Nearly the entire run of this title from 1908 through 1957 has been digitized and is available to search free of charge. Many other sports magazines have been digitized, as well. Click here for more. The Library of Congress is a truly immense place, but don't let its size frighten you. Anyone who has done research there will tell you that it is remarkably easy to use. Some baseball researchers, like Paul Dickson, do most of their work there. What resources does LOC offer to baseball researchers who can spend some time in Washington, D.C.? The organization has put together a website outlining its baseball-related resources. Digitized newspapers from the Library of Congress can be located at http://chroniclingamerica.loc.gov/search/pages. Some researchers may feel more comfortable writing to the library, but the website is truly easier and quicker, and it contains a wealth of information. Once a researcher is in Washington, it is necessary to go to the library's Madison Building to obtain a Reader Identification Card, which is good for two years. This process requires a valid picture ID and can be time-consuming. Formal research orientation classes, taught by reference librarians and dealing with many aspects of using the library, are offered regularly. The Genealogical Library of The Church of Jesus Christ of Latter-Day Saints in Salt Lake City, Utah, contains the world's largest and most complete collection of genealogical information, some of which may be useful to baseball researchers doing biographical research. Branch libraries throughout the United States-650 of them-have catalogs that list the main library's holdings, most of which can be obtained through the branches. Smithsonian Institution Libraries, National Museum of American History Branch, Constitution Avenue at Tenth Street, NW, Washington, DC 20560: 2,000 baseball cards. SABR's Ted Williams Chapter teamed with the San Diego Public Library (820 E Street, San Diego, CA 92101-6478) to augment its baseball history collection. Eventually, a large amount of historical baseball literature will be fully cataloged and index into the San Diego Public Library collection. You can read more about it here.